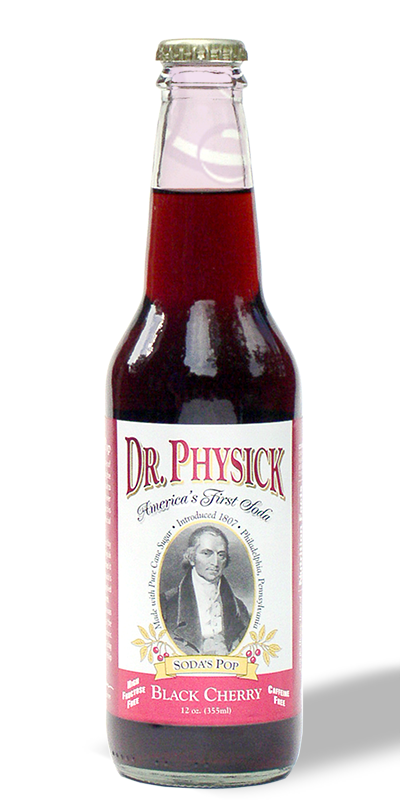 formerly Dr. Physick's estate, "Fairy Hill,"
Dr. Physick's connections to Laurel Hill Cemetery predate the construction of this, one of the few cemeteries in the nation to be honored with the designation of National Historic Landmark, a title it received in 1998. "FAIRY HILL. 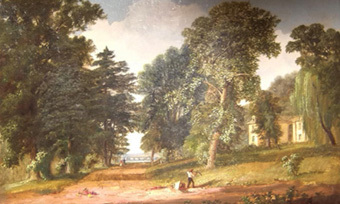 It was when I was about eight years old, (1811), that my father, (Dr. Philip Syng Physick), purchased a beautiful country seat on the river Schuylkill, it was called Fairy Hill, and indeed it used to seem to me like a fairy scene. This river is famed for the beauty of its scenery and this was one of the sweetest spots on its shore. The house, though somewhat old fashioned, was handsome and convenient. On the front and side towards the river there was a fine piazza, round the pillars of which were trained many beautiful flowers vines and sweet scented shrubs which filled the air with their rich perfumes. The lawn was very beautiful seeming to have been intended by nature for that purpose. A gravel walk ran around it, leading at times by the brink of the richly wooded hill which overhung the river while groups of forest and lofty fine trees, placed here and there pointed heavenward, and cast their long shadows on the bright green yard. How vividly this fair scene rises before me. I can almost fancy now I am watching that beautiful river as if it sparkled over the rocks beneath the bridge at the falls and wound its way rough the green hills and woods to the far off city and then on and on to the distant sea. How many pleasant wild wood walks were there, paths cut out of the side of the hill among the thick woods and rocks, with the glancing waters rushing on below. There was one, which after many turnings led to an immense rock, which overshadowed a large space shutting out all view of the blue sky above our heads, while a spring of the purest water filled a circular basin at the base of the rock. How many pleasant recollections are associated with this place when 'in that joyous time of life, the long sunny days of summer seemed only too short. Among those recollections, the most pleasant were of sweet quiet walks with my beautiful and beloved Mother. One afternoon, I remember my sitting with her on the steps of the piazza, when she, expressing a wish for some raspberries. I, delighted to please her, ran off to the garden to gather them, and having done so, sat down again by her dear side and partook of the fruit with her. How sweet they were, can I ever hope, save in paradise to taste such sweet fruit again? Then one bright summer day, she took Eliza Doyle and all the children to walk along the river shore to a fisherman's little cottage close to the waters edge. It seemed quite a pilgrimage to us little ones and how it added to the pleasure, the difficulty we had in getting round a large rock, which jutting almost in to the water afforded but a narrow and insecure pathway. And then the pleasant cool evenings I can fancy now I see my father and mother, arm in arm pacing up and down the piazza, happy in themselves and their children around them. It was one of our pleasures, too when our mother went to town for a few hours, to sit on the lap of the maids in the sweet evening air, and listen to stories of fairies, ghost and hobgoblins in clanking chains crossing the river in little boats at midnight etc, etc., until we would almost fear to look out in the still air, where the darkness of evening was gathering silently around us. But those days have passed away and the scene of all these youthful pleasures is now enclosed between cemeteries. So passes the glory of the world." Susan's aunt, and namesake, Susan Dillwyn Emlen, in a letter to her father in England, August 3, 1813, reports... "That beautiful spot Fairy Hill is sold. Some inconveniences common to country houses combined with the earnest wishes of a person named Pepper, induced them to listen (in an evil hour, Betsy says) to the offer of $17,000, which was $9,000 more than the Dr gave for it." Philadelphia artist Russell Smith later painted the Pepper Estate, formerly Dr. Physick's estate, Fairy Hill. 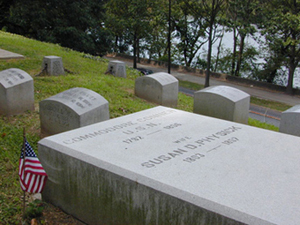 Today Susan Dillwyn Physick and Commodore David Conner are interred nearby in the Central portion of Laurel Hill Cemetery overlooking the beautiful Schuylkill River.